Hereditary Grand Duke Guillaume and Hereditary Grand Duchess Stéphanie were in Lentzweiler today in order to pay a visit to CTI Systems where they heard a presentation about the company and toured the facilities. (I hope they are free from giddiness.) CTI Systems is a global provider of integrated automated heavy load systems for intralogistics, surface treatment and the aviation industry. When they were in China late last year, the Hereditary Grand Duke and the Hereditary Grand Duchess inaugurated the company's Shanghai-based subsidiary CTI Systems China LLC. Gotta admit that while I do like to complain about her clothing choices - Hi there, wide-legged pants, glad you didn't bring one of your scarf-besties (hanging around the neck)! 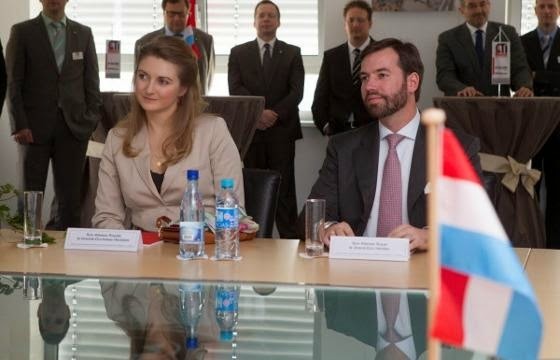 - I love, love, love the Hereditary Grand Duchess' hair as of late. More visuals of today can be found at Wort in German.